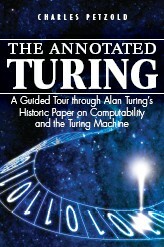 Wiley — my publisher for The Annotated Turing — will this morning ship the book's files to the printer. Sometime after that, printed books will emerge. The official publication date seems to be June 16. Yesterday morning I discovered that a sentence on page 39 contains a mixed metaphor that I probably wrote years ago and which only now leaped out to taunt me: "With these foundations being nailed into place shortly before the turn of the century, mathematics seemed to be on a good track, ..."
I toyed around with changing the sentence but finally told myself "You really have to let this go." There is no such thing as a perfect book, and if the biggest problem in the book is a mixed metaphor, this will be the best book ever! Letting go of the book — particularly one I've been working on since 1999 — is extremely difficult, both emotionally and intellectually. In the past month, as the book has made a transition from DOC files to PDF files, my freedom to make changes has been sharply curtailed. Now the book makes a final transition — from something I've owned to something readers will own, and over which I'll have very limited control. I can't control if people buy the book, or read the book, or interpret the book in the way I intended. The book now exists apart from me, and I have become irrelevant to its future autonomous existence. In an ideal imaginary world, a book is finished only when the author is fully satisfied that every word and comma is perfect. In the real world, that doesn't work. The only way books ever get finished is with the imposition of a deadline — sometimes from the author him or her self, but most often from a publisher. This is a good thing. The deadline requires much focused work to drive the book into a completed state. It is one of my fears about online publishing that books will never be finished — that they will exist forever in some slippery amorphous state, forever demanding that they be twiddled and tweaked, enslaving the author in a never-ending cycle of continual revision. The finality of publication is ultimately liberating. The author is given permission to let go, but more importantly, to move on. This book must be finished and left to live on its own because there are many other books that need to be written.